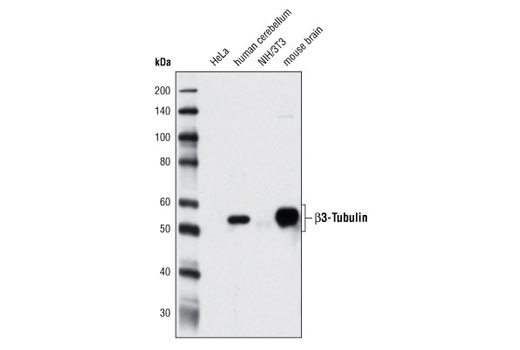 β3-Tubulin (D71G9) XP® Rabbit mAb detects endogenous levels of total β3-tubulin protein. 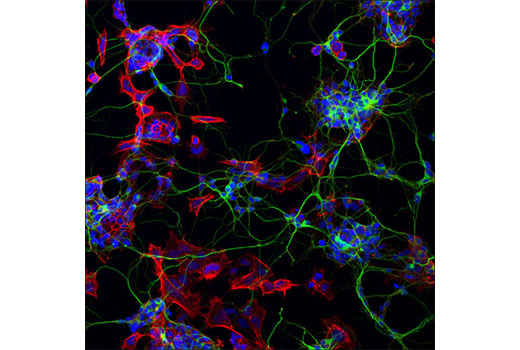 This antibody does not cross-react with tubulin isoforms expressed in non-neuronal cells. This clone is similar to TUJ1. Monoclonal antibody is produced by immunizing animals with a synthetic peptide corresponding to the carboxy terminus of human β3-tubulin protein. The cytoskeleton consists of three types of cytosolic fibers: microtubules, microfilaments (actin filaments), and intermediate filaments. Globular tubulin subunits comprise the microtubule building block, with α/β-tubulin heterodimers forming the tubulin subunit common to all eukaryotic cells. γ-tubulin is required to nucleate polymerization of tubulin subunits to form microtubule polymers. Many cell movements are mediated by microtubule action, including the beating of cilia and flagella, cytoplasmic transport of membrane vesicles, chromosome alignment during meiosis/mitosis, and nerve-cell axon migration. These movements result from competitive microtubule polymerization and depolymerization or through the actions of microtubule motor proteins (1). 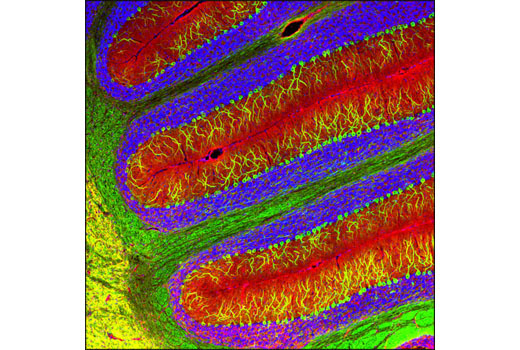 β3-tubulin (TUBB3) is one of six β-tubulin isoforms and is expressed highly during fetal and postnatal development (axon guidance and maturation) (2). Its expression levels decrease in the adult central nervous system (CNS) but remain high in the peripheral nervous system (PNS) (3). Microtubules enriched in β3-tubulin are more dynamic than those composed of other β-tubulin isoforms (4). Research studies have shown that mutations in the β3-tubulin gene TUBB3 cause ocular motility defects and other nervous system disorders. Furthermore, β3-tubulin is present in neoplastic but not in normal differentiated glial cells. Thus, β3-tubulin is a great neuronal marker (5). Jiang, Y.Q. and Oblinger, M.M. (1992) J Cell Sci 103 ( Pt 3), 643-51. Panda, D. et al. (1994) Proc Natl Acad Sci U S A 91, 11358-62. Tischfield, M.A. et al. (2010) Cell 140, 74-87. Katsetos, C.D. et al. (2003) J Child Neurol 18, 851-66; discussion 867.